JailbreakMe has to be hands down the easiest jailbreak method ever, but since it uses userland exploit like Spirit, it doesn’t hacktivate phones. iPhone dev and hacker named Sherif Hashim came up with a way to activate phones without having the original SIM cards but now it seems like Apple has found out about the phonebook SIM card trick and they have blocked it. And so if you activated your phone using phonebook SIM card, you will be getting the dreaded “Different SIM Detected” error on your lockscreen as shown in the screenshot below. Follow the steps below to fix this problem. Step 1: Restore to original iOS 4.0.1 from iTunes. Step 2: Activate your phone by using phonebook SIM card as shown in the video posted below. Step 3: Follow the step by step guide posted here to jailbreak your iPhone 4, 3GS and 3G using JailbreakMe 2.0. Step 4: Now unlock your iPhone 4 by following the guide posted here, or for iPhone 3GS and 3G posted here. Step 5: Now replace the phonebook SIM card with your unofficial / unsupported carrier SIM. 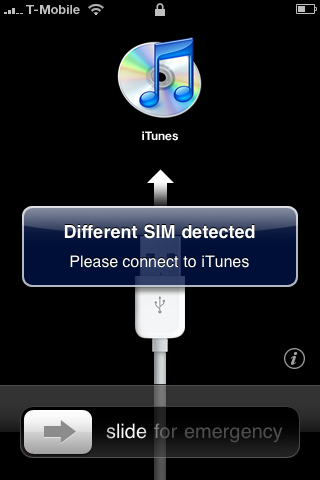 It is now that you will receive the “Different SIM Detected” error. Step 6: Download i-FunBox for Windows from here. Step 7: Connect your iPhone with you computer and let the i-FunBox software detect your phone. Step 8: Now navigate to /private/var/root/Library/ and delete the original lockdown folder as shown in the screenshot below. Step 10: Restart your iPhone. I can confirm this worked perfectly for me. I didn't bother trying the method in the article as this seemed(and was) much simpler..Thanks very much for this solution! I finally can use my 3GS again after a couple of months! After step 2, can we just put in our unofficial / unsupported carrier SIM so that we can make call even without jailbreak the phone? I hope to have a donate link in the package description soon. Please check the package in Cydia in a few days. I'm working on FaceTime among other things now and every little bit keeps me doing more. I Have a new Iphone 4 How can I activate it now with out giving my billing zip and SS# on itunes. I have 2 micro sim card but both have my phone # on them. Is there another way??? I bought an iphone 4 about 1 month ago and when i connected it to the computer it asked for activation but the phone just started working so i used it until the unlock was released and before i could get the unofficial sim card my phone went stuck so i reboot it and it rebooted on emergency mode but when i connected it to my computer the computer did not detected it or even charge it, but when i conect it to the wall charger it does charge. Yep.. Pushfix works great!!!! Totally recommand this to all my twitter friends!!!! i need help. i downloaded the funbox. 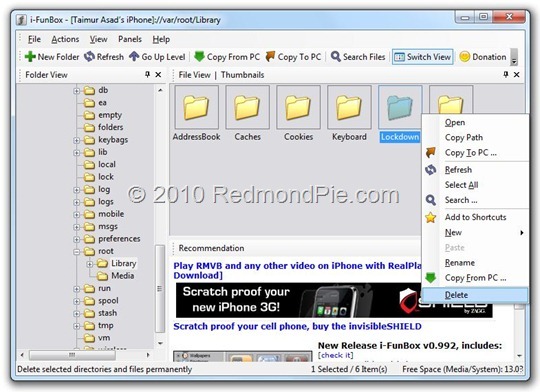 where so i find the private directory then var folder. please help, i know it is probably simple but i am going crazy trying to find it. your help is greatly appreciated!!! I have iphone 4 (4.0.1) after i delete folder “Lockdown” and upload patch “Lockdown” i can’t connect to iTunes anymore. Really i cant connect from any software iFun, Umbrella. its urgent… thnk u fr replying!! I follwed the instruction right to the end, restated iphone and ended up in still DFU mode!!! wat hav I made wrong, is any1 came accross same situation? Can any1 pls helpme out? Thanks guys that was awesome… Huge Thanks!!! !